There’s a mysterious doorway under your bed and you’re going to ignore it. I don’t think so. Before you can say “Captain Cook’ you’re climbing down a rickety ladder that stretches out into a thick mist. Somewhere below, down, down, and further down still, is the rainforest that you’ve been to once before, what now seems like ages ago. There’s magic, strange creatures with cunning and snares and heaps of surprises and maybe even a catastrophe waiting to happen… and you can’t wait. Four kids and one sleep-over = a very strange, scary, magical experience. 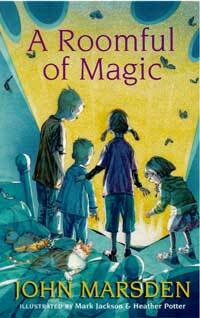 A Roomful of Magic is the second spellbinding adventure set in the magical rainforest by the highly acclaimed and popular author, John Marsden (Pan Macmillan, Australia, 2004). Illustrations by Mark Jackson and Heather Potter. Cover illustration, front and back 8 B/W chapter headings. Illustrations in pencil and gouache paint. If the magic spring water is not found soon it will be too late and all you’ve got to help you is some very mysterious advice, so mysterious that you haven’t a clue what it means, and a friend. Creeping Shadows, towering ancient, secretive trees, don’t scare you one bit, well maybe a bit, but you’re not going to let on about it. You have to be watchful and wary at all times, because in a magical forest the creatures are never quite always as they first seem. 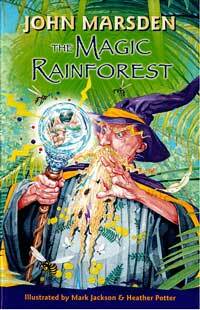 Australia Post commissioned author John Marsden, and the illustrating team of Mark Jackson and Heather Potter to create ‘The Magic Rainforest’, a new Australian fantasy which is a beautifully illustrated, 64 page book. The book’s enchanting multi-generational story – with wonderful Australian characters and creatures – brings the story and the stamps to life. The creatures featured on the stamps and the role they play in the story of ‘The Magic Rainforest’ make a perfectly delightful introduction to the magic of stamp collecting. Published by Australian Postal Corporation 2002. 8 full colour illustrations / 23 B/W illustrations. Cover illustration (colour) front and back. 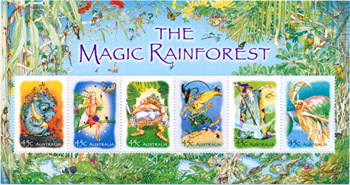 In a strange, magical forest, Sam and Naomi encounter six very unusual characters who each feature on the stamps for Australia Post’s ‘Stamp Collecting Month’ 2002. Established in 1993, ‘Stamp Collecting Month’ aims to be fun and interesting to young and older children and is a way of encouraging stamp collecting as a hobby. Parents and schools are involved in choosing appropriate themes and in 2002 it seemed like everyone was either reading J.K. Rowling’s ‘Harry Potter’ books or pondering and debating whether fantasy still had relevance in our busy, matter-of-fact lives. Why had it disappeared and whey the overwhelming interest in its return? Why this, and why that, and all the talking in between, led Australia Post to commission the author John Marsden to write ‘The Magic Rainforest’, where there dwells the most wonderful, curious and tricky characters. Melbourne artists, Mark Jackson and Heather Potter, have cast their own magic in creating images of a bunyip, fairy, gnome, goblin, wizard and sprite, and the beautiful images will no doubt get the stamp of approval from children. The stamps will help keep magic alive – at least for a while. The Age. September 26th 2002. Artwork – Pencil and gouache paint. The world’s bound to be a scary place to someone no bigger than an ordinary thumb. You can be pushed around from pillar to post, and before you know it you’re saying “Yes Horace dear” to a great big irritable warty-faced toad. When you take the advice of a white butterfly, you’ll find the help that you need from unexpected friends. This is an intelligent retelling of Andersen’s story with fresh modern vocabulary and flowing style enriched by complex, finely detailed illustrations. 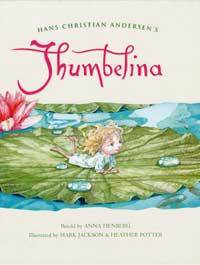 Old world images capture the innocent vulnerability of Thumbelina and celebrate the intricacies of life at the miniscule level. Realistic cockroaches and appropriately ugly toads add tension to leaven any prettiness. The traditional fairytale quality of the story is captured in the thistledown effect of the final illustrations, the elfin face of Thumbelina, and the soft, exquisite end papers. Published by Pan Macmillan Australia Pty Limited. 2002. 32 page children’s picture book. 32 colour illustrations, plus cover and end papers. 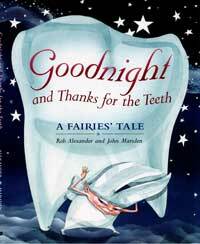 This imaginative and funny picture book has everything you have ever wanted to know about tooth fairies. In this wonderful fantasy world, tooth fairies know all about how teeth fall out, from crashing your bike, to eating sticky toffees. But fairies don’t want adult’s teeth, only children’s fangs. Older children who have already profited by careful tooth care will love the humour and illustrations in this clever, innovative addition to children’s books. Published by Pan Macmillan Australia Pty Limited. 1999. Text by Rob Alexander and John Marsden. 42 colour illustrations plus cover and end papers. Heather Potter’s exquisite illustrations invite interpretation far in advance of their immediate value. From – Rhymes for little republicans. Roger Palmer. Text compiled by Robert Holden. Illustrations by Heather Potter. Design by P Mark Jackson. 10 colour illustrations, plus cover. Illustrations in pencil, ink, black biro, gouache paint. In an inspired revival of the classic nonsense of Edward Lear, P Mark Jackson has taken some of the most enjoyable and witty limericks and created accompanying illustrations of stunning impact. This is a book of timeless appeal and one that both adults and children will love for its humour and wonderful illustration. Published by Dragon’s World Ltd, UK. 1996. Design and illustrations by P Mark Jackson. 13 colour illustrations, plus cover.